What Instruments Are Played in Merengue? Merengue is a Caribbean dance and music style traditionally played in 2/4 time--though is increasingly performed in 4/4 time--and is usually associated with the Dominican Republic, according to the IASO Records website. This jubilant and frenetic music is structured to encourage dancing and engagement through its upbeat rhythms, call and response between the soloist--whether a vocal singer or musical instrument--and chorus of singers or instruments, as well as through its unique instrumentation. This percussion instrument is a short, two-headed cylindrical drum played with a stick on the right head and a palm on the left head, according to the Grupo Fantasia website. Mind Spring notes that the tambora is made of wood and goat skin, tied together with cabuya rope, which is made of pita fibers from the Agave Americana, a type of grass used to make cords and ropes. The back and forth between the tambora, when the player does a tambora roll, and other important instruments like the saxophone and accordion is an illustration of the use of call and response and gives merengue its "characteristic drive," according to the Salsa & Merengue Society. Originally, one-row button accordions were used in merengue and were eventually replaced by the saxophone since one-row button accordions were unable to play sufficient keys, but with the advent of two-row button accordions, the accordion has made a comeback in this musical style, according to the Salsa & Merengue Society. 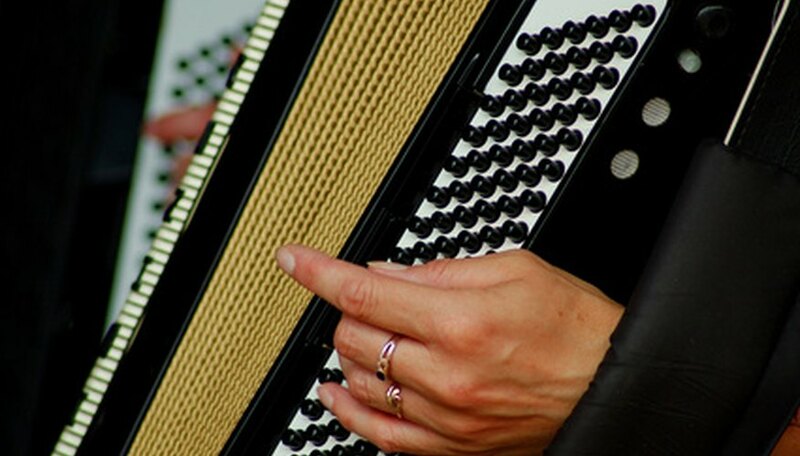 The accordion has a keyboard, buttons and bellows to create a unique sound. It isn't surprising that the same instrument associated with such an upbeat music as merengue is also a dominant instrument used in polka music, which is also usually performed in 2/4 time signature. According to IASO Records, the accordion made its appearance in the Dominican Republic when Germans came to the island in the late 19th century and traded their instruments for tobacco. The guira is a metal scraper played with metal wires attached to the scraper, according to Grupo Fantasia. This cylindrical instrument constitutes the percussion base of the rhythm, says Mind Spring. The player holds the guira by its small handle and slides a small fork across the bumps on its surface. This reed instrument unites with the accordion to play catchy, syncopated riffs or jaleos, which help motivate and stimulate dancers, according to IASO Records. This wooden box with between four and eight metal tongs fixed across an opening in the front is plucked with the thumbs, according to Grupo Fantasia. This instrument is more likely to be part of smaller merengue bands with less instrumentation since it is smaller and quieter than some other more modern instruments used in this style of music. Electric bass guitar, tuba, trombone, conga, timbales and keyboards are also sometimes used in merengue music. What Instruments Make Up a Mariachi Band?